This entry was posted in Humbug! and tagged complaints, daily life, humor, humour, IBM, musings, panic button, relieve stress, summer job. Bookmark the permalink. Ages ago, I worked at IBM as an onsite employee of a company that provided their communications. Whenever I felt frumpy or unattractive, I ate lunch in the employee cafeteria, filled with IBM’ers that met your description. The resulting stares and silence as I passed in my mini skirt was worth the 5 minute walk down there. If I had an old black-and-white photograph of IBMers from those days and colorized it, the photo would still be only black and white. Love the office manager’s name … amazing how people can naturally fit the description. The story is true. I can only remember the office manager by his nickname – and it fit. This is probably related to the dummy thermostat in some offices. Changing the setting does nothing to change the temperature, but somehow it makes people feel better. It is very similar except that you still feel hot or cold. 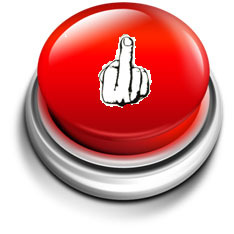 With the Panic Button you had the pleasure of annoying some people you wanted to annoy. Don’t anger a lady who knows how to kickbox. 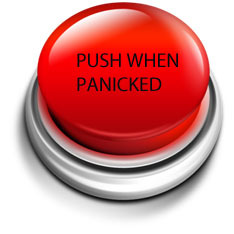 I don’t have a panic button, and I think it’s because I never worked for IBM. But I never would have lasted very long there if I had to dress in that garb every day. It was like Men in Black without Will Smith, Tommy Lee Jones and aliens. I love this. And I actually have a panic button. It’s under my desk, and I flip it if an axe murderer comes in. The police arrive with guns drawn. I know this, because I’ve accidentally pressed it many a time. Well, better police and NO axe murderer than the reverse (Although, I bet the police are not happy. I hope you feed them).